Individually labeled packaging for strong display and easy inventory control. Canvas weight before treating. Custom and finished sizes available. Sizes listed are "CUT SIZE". Tarpaulin may be slightly smaller due to seams and hems. Indvidually labeled packaging for strong display and inventory control. Sizes listed are "CUT SIZE." 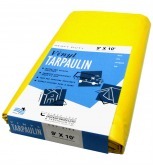 Tarpaulin may be slightly smaller due to seams and hems. Custom and finished sizes available. Sizes listed are "CUT SIZE." Individually labeled packaging for strong display and inventory control.